(Fire·man·ship): "The practice, skill and trade of Firefighting"
Sunday Night Social: Today will be our LT. Brad Clark “Send It” Lager beer release. Lt Brad Clark was going to be a speaker at this years Conference. Brad lost his life on October 11, 2018 while working at an emergency scene. Shuttles will be provided from the hotels to Mt Tabor brewing. Other options are Taxi, UBER or LIFT personal vehicles not recommended parking is very very limited. This year's Conference will provide several hundred of hours of education and training for more than 700 Firefighters of every rank, from Fire Departments all across the country. Have you noticed your Fire Department is steadily increasing the amount of required training in topics other than Fire Suppression? Spend a few days with us studying the art of Firefighting and perfecting your craft. We donate the net profits from the event to Sons of the Flag, a nonprofit organization that provides critical support to military service members, firefighters and civilians who have survived burn injuries. So far we have donated $175,000! This year we plan do donate much more, and with your help we can keep providing critical funding for burn care across the country. Whether you want to meet some of the speakers, talk shop or catch up with old friends, your evenings will be full. Every year we survey the attendees for their feedback, and one of the overwhelming responses what that the evening social events were a huge benefit. We plan to host a social event each night of the Conference this year as well. Nick Landry (Eagle Fire department) - "Vertical Ventilation Viability for the Truck Operator"
John Salka (FDNY) - "Structural Fire ; Primary Search"
Ben Shultz (West Palm Beach Fire Rescue) - "Every Second Counts"
James Johnson - "Facts Not Fear"
Brad Clark (Hanover Fire-EMS) - "The War to Win the Middle"
Santiago Lasa (Boston Fire) - "Beacon St. LODD's of Ed Walsh and Mike Kennedy"
Kiel Samsing (Newport News Fire Department) - "Estimating the Stretch: The Long and Short of Engine Work"
Dan Doyle (Pittsburgh Bureau of Fire) - The House on the Hill. "Topography Challenged Residential Fire Tactics"
Dena Ali (Raleigh Fire Department) - "Understanding and Preventing Firefighter Suicide"
Sam Hittle (Wichita Fire) - "Forcible Entry Wins are in the Details"
Curt Isakson (Escambia County Fire Rescue) - "It's worth the Risk"
Shuttles will run from the Paramount Hotel to the Crystal Ballroom for the Lectures on Monday, Tuesday and Wednesday. Shuttles start at 0645 and end at 0800. Shuttles back to the hotel start at 1800. "The DIY Engine" & "Gaining Relative Superiority: The 2 1/2" Attack Line"
Thank you all for the huge support for this years Firemanship Conference. Registration has been overwhelming. Unfortunately our host the Paramount Hotel has reached capacity. We found an additional accomidations at the Hotel Modera in downtown Portland. We have reserved a block at Hotel Modera for a discounted rate of $169.00 (plus tax) a night for either King or a limited number of double Queen rooms. The block is reserved from February 24th untill March 1st. If you would like to stay extend your stay outside the block, please contact the Hotel Modera directly and they will honor the price for the 2 days prior/post conference. Please use this link below to make a reservation. The group discount code will automatically populate, then select your date range. The Group Code will also be on your Registration Confirmation email, or write to admin@firemanshipconference.com and we'll send it again. There are many other hotel options downtown, and AirBnB is also a good bet for groups. 1) Taxicabs (approximately $35 before gratuity). Radio Cab offers discount with coupons available on their website. During the Conference we will provide shuttles. Shuttles will run from the Paramount Hotel to the Crystal Ballroom for the Lectures on Monday, Tuesday and Wednesday. Shuttles start at 0645 and end at 0800. Shuttles back to the hotel start at 1800. Shuttles to the HOT Classes will leave the Paramount Hotel at 0700, to reach the HOT Class sites around 0730. We reserve space at several downtown bars and restaurants so that we all have a place to meet up each night. Social events start soon after the Lectures end or the HOT Class shuttles arrive back at the hotel. Early registration and meet and greet. The LT. Brad Clark “Send It” Lager beer release. Lt Brad Clark was going to be a speaker at this years Conference. Brad lost his life on October 11, 2018 while working at an emergency scene. Live Auction and Story Teller night. We will be having our live Auction for the Conference. Are you in need of a new door prop, this will be the time to get it. 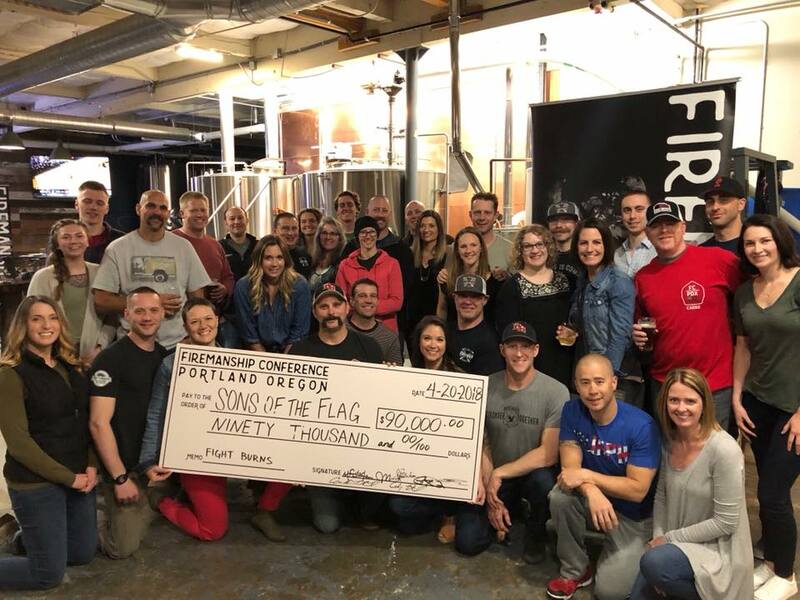 In 2018 you helped us raise another $90,000 for Sons of the Flag! In 2017 you helped us raise another $40,000 for Sons of the Flag! With your support, we donated $45,000 to Sons of the Flag! Sons of the Flag will receive all of the profits from this year's Firemanship Conference. In the last two years we raised $85,000, and this year we plan to give much more. Mission: The Resource for Burn Survivors. Who We Are: Sons of the Flag is a nonprofit organization committed to supporting military, first responder, and civilian burn survivors by providing funding for innovative research. We bring together passionate community leaders, pioneering physicians, experienced military service members, dedicated first responders and purposeful civilians to complete our mission. Commitment: Sons of the Flag pledges to seek out and support physicians across the nation to perform advanced clinical trials aimed at improving methods in burn surgery. Vision: The ultimate goal of Sons of the Flag is to accelerate the process of testing leading technologies and pushing them into circulation for immediate use. This will aid the recovery and lives of burn survivors across the nation.